Potato Farming and the Art of Being a Shut-In Old Man. Imo kusai or Potato stink is a word I recently learnt from a friend. I’d been joking about become a potato farming old lady some day when she said I was gonna stink of the countryside…or Imo Kusai. I’ve taken quite a liking to this word so much so that it’s gone and inspired me to post this. Not sure if I’ve ever said this enough…but I love the countryside (or Inaka as they call it here). Back home, I’d call it ulu pandan. I love being stuck in the middle of nowhere…with nothing but fields, fields and fields as far as the eye can see or deeeeep into the boonies where the houses get more spread out and the magestic mountains appear to be your neighbors. Coming to Toyama, I discovered that these places actually exist. Perhaps it’s a case of the city mouse/country mouse story…or seeing greener grass on the other side…but, everytime I venture out, I fall in love with Inaka a little bit more. It’s awefully peaceful…and the people seem to get a lot friendlier…mind, I generally find Toyama to be a LOT frindlier compared to Tokyo and Singapore which are huge metropolitan cities (or Tokai as they call it here). Despite living pretty much in the centre of Toyama City, it’s nowhere near as Tokai as home. 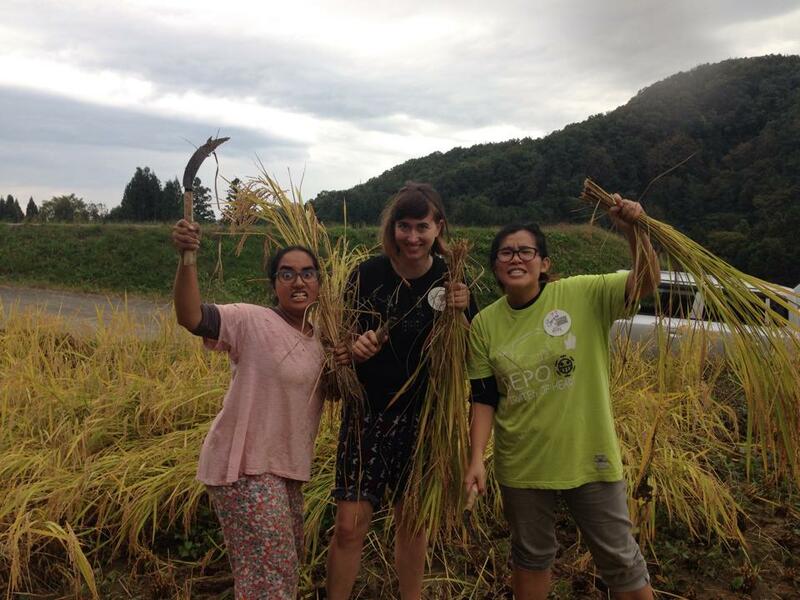 Recently, I came across an amazing rice harvesting event in Uozu (another city in Toyama). I signed up without much thought and even roped in my 2 visiting Singaporean ALT buddies…cuz RICE. The event turned out to be SO much fun. I cannot even begin to express how much fun it was. Yoga in the muddy paddy field. Competing in groups of 4 to hang the rice out to dry. Learning how to cut rice manually and tie them into bunches. Doing a rice harvest dance. Riding on the back of a mini truck driven by an obaa-chan with fellow participants (both Japanese and foreign). Getting an amazing home-cooked lunch with a surprising amount of veggie options that filled me up real good. Listening to Shamisen, World and Minyo music and singing along. WINNING first place of the competition….cuz obaa-chan judges are the BEST. Getting 2kgs of rice as a prize. Immersing myself in nice quaint onsen. Getting some figs before leaving for Toyama. I can promise you that this won’t be an experience you can get back home in Singapore. My friends who saw photos of me at the event informed me that I looked incredibly happy and the friend who taught me the word Imo Kusai said I just might be cut out for the Imo Kusai life afterall. Planting rice is not fun. Bent from morn till set of sun. Cannot stand. Cannot sit. Cannot rest a little bit. But, with friends, it’s heartwarming. The squelching mud under my feet was the most theraputic thing ever. So, while it’s obvious that a 1 day event does not equate to a lifetime’s labour on the fields…I certainly am considering the field life a lot more than before. Thanks for this one Dom! This brings me to my next point that I might actually be a a Shut-In Old Man (or Hikikomori Ojisan as they say here). I was talking to my 2 Singaporean ALT friends from far-away prefectures when I came to this conclusion. We were discussing my tendencies to make middle-aged/old people friends more than young 20-something year old friends. It was odd, we decided for a normal (well as normal as a Vegetarian theatre-girl turned ALT can get i guess) 24 year old to be able to make friends with the old station master and the Matcha shop aunties and yet have issue with attending halloween parties like a normal person without being accused of being a kidnapper (this is a true story). Odder yet were my tendencies to make terribly lame, freezing-cold, dad jokes and enjoy the comfort of my kotatsu while watching anime and avoiding parties like the plague. I survived on reheating frozen food from months ago and love nothing more than my track pants and t-shirts. It all pointed to one thing. That I was a Hikikomori Ojisan. Somehow, it all made sense and my world view became a lot clearer. I could make peace with myself, knowing that somewhere in my 24 year old body, there was a Hikikomori Ojisan who enjoyed farming potatoes and chatting up old ladies. Makes SO much sense doesn’t it? Ps: Please take this article with a pinch of salt. I’m quite obviously not a Hikikomori Ojisan and am not planning to become a farmer any time soon. That was a joke.